Echipa AVmall incearca sa mentina acuratetea informatiilor din acesta prezentare. Cu toate acestea, in anumite cazuri, pot aparea mici inadvertente pentru a caror semnalare va suntem recunoscatori. Ne poti contacta oricand pentru a clarifica eventuale nelamuriri. Nu uita sa mentionezi in corespondenta ta numele exact al produsul. Fotografia produsului Boxe Active Yamaha ISX-B820 are caracter informativ si poate sa difere de produsul real sau sa contina accesorii neincluse in pachetul standard al produsului. Specificatiile tehnice pot contine erori de operare si pot fi schimbate fara instiintare prealabila de catre producator, neconstituind obligativitate contractuala. Free to move, Free to dance. Rest after your day with a new style audio. it's an endlessly enchanting companion. Stylish and wireless — the new Restio. With a sleek stand and minimal proportions, Restio looks like a work of art. It was created by completely re-imagining the concept of a music source as part of the interior. The independent body style makes music an interior design element, and because the sides are slanted, it appears to be a thin panel. The front grille uses expanded metal, providing an attractive texture. The striped pattern printed underneath the grille conveys a feeling of depth, giving the impression that the music is coming from within the entire front surface. Merging beautifully into the living space, this is an entirely new audio form that you can match to your lifestyle. With a 9cm body and a half-moon shaped stand, you can position Restio right up against a wall. 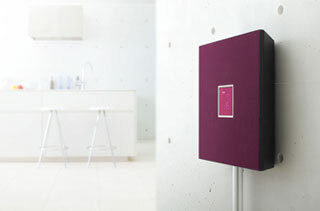 What′s more, the standalone style doesn′t require a shelf, so there are no restrictions on where you can put it. You can even remove the stand and hang it on a wall (requires an optional bracket AT-800). 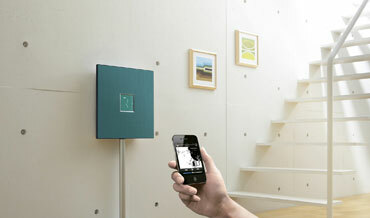 It′s the perfect way to match your music source to any room′s decor. Built-in Bluetooth® means that you can enjoy all the music stored on your iPhone, Android and other smartphones wirelessly. Put your Restio wherever you want it, and use your smartphone as you usually do to operate the playback functions. 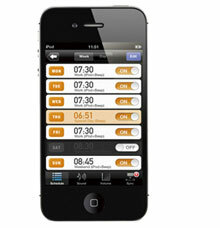 With Yamaha's DTA Controller app, you can set the alarm time differently for each day of the week, as well as make detailed IntelliAlarm settings and transmit them wirelessly. You can dock your iPod or iPhone directly into the top of the unit, for a digital connection that delivers high quality sound so you can thoroughly enjoy your music library. And if you have an app, such as one that lets you receive streaming music, you can further expand your listening pleasure. In addition to a CD player and radio (FM), Restio also has USB and Aux-in terminals for plugging in USB memory devices and other sound sources. 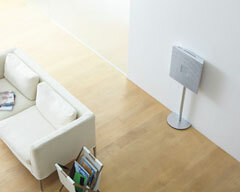 Using a two-way, four-speaker system finely tuned to HiFi audio standards, Restio is designed for premium quality sound. Delivering powerful, expansive bass and crisp, precisely contoured treble, it ensures complete enjoyment of everything from the fast kick of a bass drum to gentle sounds and vocals that seem to be right in front of you. It also includes a three-band equaliser, so you can adjust the sound to match the type of music and your own preferences. The stylish digital clock gives you a choice of two patterns: the usual number display and a unique display that combines numbers and an indicator. An auto dimmer function adjusts the brightness of the display to match the brightness of the room. It also features Yamaha′s IntelliAlarm, which first gently plays the music of your choice and then beeps to ensure that you are fully awake. Nu sunt recenzii pentru Boxe Active Yamaha ISX-B820. Fii primul care scrie una!